HEALTH & FITNESS THROUGH THE EYES OF A PROFESSIONAL MODEL. Don't miss out on FREE health & fitness tips plus upcoming eBooks on Weston’s specific diet & training that are releasing 12/28/18— SIGN UP now with your email address and get connected with a professional model and Men’s Health cover guy! Weston respects your privacy. Your email will NOT be shared or distributed to any third parties not affiliated or operated directly by Weston himself. Thank you so much for subscribing to the Weston Boucher Fit newsletter! Now let's enjoy the journey to stay healthy, happy and fit together! The Year Round 6 Pack // My Diet & Training // OUT NOW! Weston Bouchér is a 39 years young professional model and fitness influencer residing in the sunny San Diego surf town of Encinitas, CA. Since the age of 15, health & fitness have been a way of life for Weston. As his father Jesse was deeply rooted in the glory days of bodybuilding, having regularly worked out at the same Gold's Gym in LA that Arnold trained at and made famous while filming Pumping Iron. His mother and father Jessie and Jeri also owned and operated a fitness supplement line called SoCal Supplements, so there was no shortage of fitness presence rubbing off on him while growing up. Fast forward many years later and Weston went on to become a professional model, signed with several top agencies(LA Models, Brand, LA Talent, Wilhelmina, Shamon Freitas, SLU, InStyle, MODA), and has represented many iconic brands such as Men's Health Magazine, CELLUCOR/SCIVATION, 6 Pack Bags, Lululemon, Harley Davidson, Cadillac, Mattel, Mercedes Benz, Lexus, LG, Indian Motorcycles and ASRV. It was through his close friend and fitness mentor/coach George Waszczuk(Team George Fitness) that he was able to get in the best shape of his life just before taking his first modeling portfolio shots. Which those photos garnered the agency attention he needed. 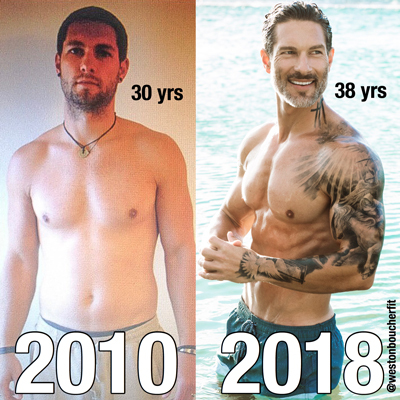 So now with the continued aesthetic demands of keeping up with models in their early 20's and washboard abs, Weston has found a way to defy age through tailored methods of proper and consistent nutrition, strength training and cardio. Specific aesthetics, proportion and look is key for the professional modeling world. Just the right amount of lean muscle mass, definition, and size can make or break a client booking. Let alone the importance of health effects through proper hydration and diet for the skin, facial structure definition, and vibrant appearance. Through Weston’s various social media accounts, more notably Instagram and YouTube, there has been a big response to Weston’s physique-focused posts. As there are a great number of people who are looking to get fit, but they don’t relate or identify with the same goals of a bodybuilder or even a ridiculously shredded stage-ready physique competitor, which neither are sustainable from a lifestyle and health standpoint long term.